* It’s not that it is unpleasant, it just doesn’t smell inviting. * The base is two of my least favorite notes – cedar and vetiver fighting for dominance. Summary: The bow tie on the bottle is cute. There, I said something nice. Some Bond No 9 scents work really well on me and others really don’t. The Scent of Peace for Men is in the latter category. I wore it for a week and I was surprised at how much it projected and how many people commented on it. People from across the room could smell it and they generally didn’t say nice things. Cedar and vetiver don’t work on my skin – almost as a rule. Combining them on my skin for the long-lasting base – yes, more than 12 hours, so longevity is good – is a pretty horrible experience for me. I wouldn’t say it is as torturesome as Houbigant Fougère Royal but it is not something I would choose to wear ever again. This scent makes me unhappy and not peaceful, but maybe you will have a different reaction to it. 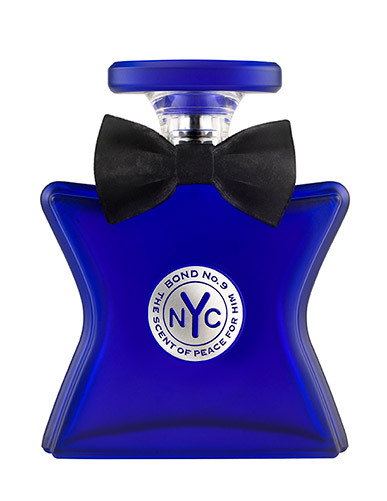 Bond No 9 Fragrance are available from Saks Fifth Avenue and Bond Boutiques. Sample received from sales associate. Image courtesy of Bond No 9 website.